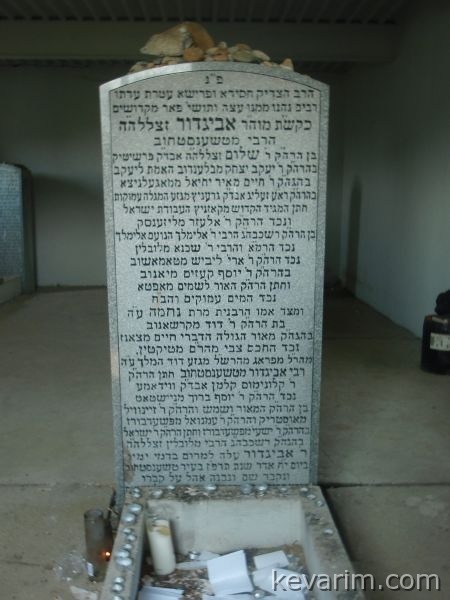 The Rebbe who was originally interred in Chensechov was moved to New Jersey in 1971 by his daughter the late Satmar Rebbetzin, Alta Fiega Teitelbaum. According to the matzeiva (tombstone) the cemetery was suffering from neglect and was in danger of being uprooted. Apparently, he had a large ohel in Chensechov as well. Do you know if there is a picture of the Rebbe? Someone in Czenstochov found the Ohel of the Rebbe, and we thought that the Rebbe is still buried there. The Ohel is broken down, the enterence with the front wall is still standing there. But I see now that the Rebbe is not there anymore. The Siftzei Tzaddik is bureid there though! You are welcome to come to Cznstochov any time! Yaakov. The Rebbetzin was a daughter so that would make him an einikel. The Rebbetzin had a elder brother named Rabbi Yakov Yitzchok, who was Rebbe in Tchenstochov after their father. He had a son named Chaim Sholom Yechiel, from his first wife, who cames to E. Israel before the WWII with his mother, and lived in Flatbush (picture of his Matzeivo, see http://www.ivelt.com/forum/viewtopic.php?f=31&t=7201). Rabbi Yakov Aharon Shapiro from Far Rockaway is a son of Chaim Sholom Yechiel.